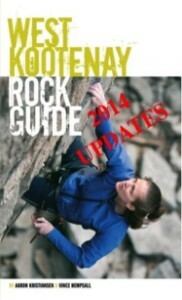 Wonow Media has announced the 2014 West Kootenay Rock Guide Updates are now available to download for free. 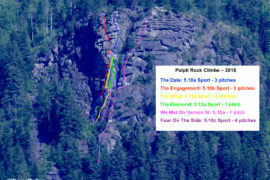 The updates include over 200 new sport, trad and alpine rock climbing routes from all over the West Kootenay region of South-Central British Columbia including Castlegar, Nelson, Slocan Valley, Arrow Lakes region and Ymir as well as beta on Grand Forks and Onion Creek in Washington State, just over the border from Rossland. 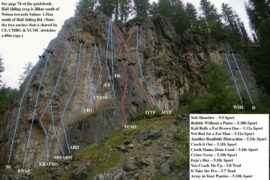 The free PDF download also includes a tick list of all 500+ routes in the region, from the 5.4 trad route “Exfoliation” at Kinnaird Bluffs to the 5.13 sport climb “A Delicate Push” at Kootenay Crag. 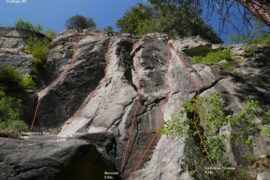 What it does not include, however, is photo topo maps. Those will showcased in separate posts such as this one in the “rock updates” section of Wonow Media be available for retail in the coming months. If you have any corrections to these updates, please contact Vince Hempsall at: vince (at) wonowmedia.com. Click here to go to the page where you can download the free PDF.